The history men would have to wheel in their record books piled high in their wheelbarrows to find the last time an Edinburgh derby ended with such harmony - or what passes for harmony when these clubs go at each other. When it was over, both managers sat in the little interview room below the main stand and declared themselves content. Neither spoke of an injustice perpetrated on their team. Neither bemoaned a penalty decision, a red card or an offside. We didn't exactly see smiles from Robbie Neilson and Alan Stubbs but there was a shrug from the pair of them, a shrug that said 'acceptable result' and 'no harm done' and 'onwards and upwards'. Stubbs singled-out referee Steven McLean for praise. The Edinburgh derby boffins will spend the week researching the last time an official in this fixture came in for such a reaction. When his turn came, Neilson was asked about the yellow cards that McLean handed out to Jason Cummings and Jamie Walker after they scored the game's two goals, and said he had no complaints. The referee got it right both times. Truly these are changed times for the Edinburgh teams. It might be unwise to presume that the supporters on both sides had the same philosophical air in the wake of the first derby of the year, but you'd fancy that many of them would have. Hearts did not play well and while their 100% record at home in the league is now at an end, at least their unbeaten run in the Championship extends to another game. That's 19 without loss. When you turn in a performance that is a level below what you are capable of and still avoid defeat against a newly-energised rival then that's not a bad day's work. Not great, but not damaging either. The visitors, more so than the hosts, might have had cause for regret, but even Hibs' disappointment has to be tempered with reality. In a game - particularly a second half - that was painfully low on accuracy and composure, Hibs created a fraction more and were the better side, and for that they will take comfort. It didn't bring them a victory they so desperately craved but it continues their own good run which shows just one defeat in 16 games dating back to the end of September. From where they were - a dispirited shambles seemingly with no way out of the mire - they have become organised, ambitious and hard to beat. Normally, on days such as this, both sets of fans head for the exits, one side letting out a collective roar of delight and the other letting loose a guttural groan, but this was the exception to the norm. Honours even. Pride intact. And the knowledge that after so many dog-days in the recent past, they are both on the right road. Hibs have been such a disappointment for so long that the temptation is to greet predictions of a recovery like an unexploded bomb. We've learned to approach with caution. This was another day when their renaissance was put to the test and it was a test they passed. After the wonderful way in which they took care of Rangers last week the challenge was to front up against the league's strongest side in a place where their opponents had won nine in a row in this competition this season, while scoring at a rate of more than three goals per game. From the off, Hibs set the tempo. They harried Hearts and forced mistakes. After 20 seconds, Alim Ozturk lost the run of himself in front of his own goal and almost gifted a goal to Cummings. It was only the shock of the chance falling his way so quickly, and the alertness of Neil Alexander in the Hearts goal, that stopped us having the most dramatic beginning. Hibs pressed and pressed. They ransacked Sam Nicholson of possession and then ransacked him again. They caught Morgaro Gomis in a web and took the ball off him, too. They were in the faces of their opponents with an intensity that Hearts struggled with. "Ten minutes later the game turned when Jamie Walker curled a sumptuous shot past Mark Oxley. It was a special moment and it dropped out of the sky for Hearts, who had scarcely existed as an attacking force up to that point." Much has been said of Scott Allan since he joined Hibs. Young, gifted and in control of the midfield, he has given his team an incisiveness that was so feebly lacking last season. We saw it beautifully against Rangers and midway through the first half here we saw it again. His ball across the face of the Hearts goal was a delicious moment in a match that produced so little on that front. The delivery was excellent and so, too, was Cummings' opportunism in getting behind Ozturk to tuck away the opening goal. It could have been two, of course. If Hibs folk had any angst in the aftermath then it would have surrounded the 'what-might-have-been' had Cummings put away a fine chance with his head, created by a Lewis Stevenson cross on the half-hour. He didn't and it was telling. Ten minutes later the game turned when Jamie Walker curled a sumptuous shot past Mark Oxley. It was a special moment and it dropped out of the sky for Hearts, who had scarcely existed as an attacking force up to that point. This is the thing about Hearts, though. We have admired much of what they have done this season. In the Championship, we have seen them put four and five goals past Queen of the South, Dumbarton, Livingston, Cowdenbeath, Falkirk and Raith Rovers. It's not just their capacity to put teams to the sword that has impressed, though. It's their resilience on days when they have been nowhere near their best. They've had to grind as they built their big lead over Rangers and Hibs. They've had to battle to one-goal victories over Livingston, Falkirk, Raith Rovers and Alloa. They've had to pull out the stops at the death to defeat Rangers at Ibrox and to get a draw with Hibs at Easter Road. Against Hibs at Tynecastle they had to dig deep again. Once more, they found something. Just enough to stave off the challenge of a team that is the polar opposite of the soft touch we saw at the fag-end of last season when they couldn't score, couldn't defend and couldn't win when their survival depended on it. 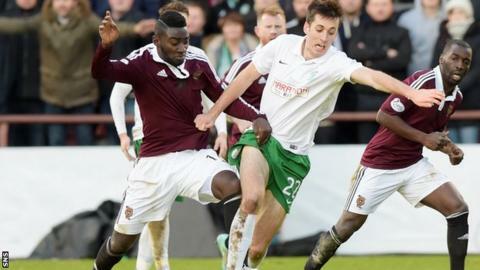 This was not the greatest Edinburgh derby, far from it. But as these two clubs find themselves, the story of their revival continues to enthral.